I know little of MZI’s early history but it belonged to a succession of relatives before coming into our lives on the back of a determined campaign waged remorselessly upon my long-suffering father. Believing that it would prove the lesser of several evils, he capitulated. The things you do for your kids. The downside of sainted parenthood was the unenviable task of driving it from Dublin to Cork. Dad recently told me he recalls little of the journey – on balance, it’s probably just as well. Once home, our initial examination wasn’t promising. The driver’s door was held in place with rope – and probably the occasional decade of the rosary. It refused to stay in third gear without physical force, the engine pumped out blue smoke and the offside door sill, boot floor and rear valance were composed primarily of air. On the upside, it sported a full-width aftermarket dash filled with non-working instruments, attractive sports wheels and a duo-tone paint job. Consumed with fantasies of Cooper replicas, I blinded myself to its more obvious failings and threw myself into a grand delusion, armed with a budget of approximately £1.57. We really should have sourced a better bodyshell, or just started from scratch with something less clapped-out, but very little can hold a candle to the obsessive devotion of a smitten sixteen year-old. With no budget to speak of, we pulled in some favours and sourced a later-specification 998cc engine, but were forced to use an older 850 gearbox – which did interesting things to the gearing. With driver’s side the hinge panel welded up, the driver’s door no longer fell off when opened. The remainder consisted of blood, sweat, some tears, and vast quantities of filler. To be honest, it was a death trap, but it’s worth remembering there was no vehicle testing at a time when half the cars in Ireland were held together with bailing twine. And don’t for a moment think I’m kidding either. Like most skin-deep restorations, it was fine as long as you didn’t get too close. However, once you did, near death experiences came thick and fast. 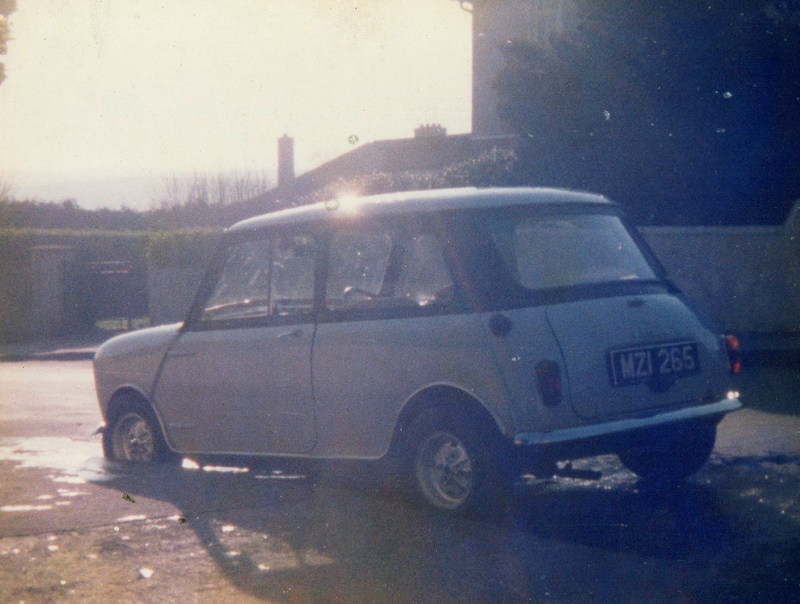 First the exhaust fell off, then the steering column served a formal separation notice with the rack one dark evening. The front hydrolastic suspension displacers became chronically depressed, which combined with ancient remould tyres served to make the handling somewhat amusing – to say the least. But driving it was always an adventure even if it arrived home on the end of a tow rope more times than I’m willing to admit. The subsequent arrival of an even more decrepit Alfasud saw all efforts and available funds redirected and MZI consigned to the parental garage, slowly disappearing under gathering detritus. Years passed. I would occasionally look in on the poor half-buried thing on trips home and turn my shamed face away. 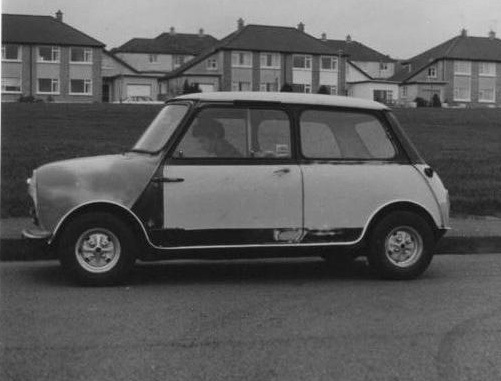 One day, a passing enthusiast stopped past and after a brief negotiation with dad, the Mini was his. It would be comforting to imagine the dedicated restoration that ensued, but I suspect the truth is less cozy. 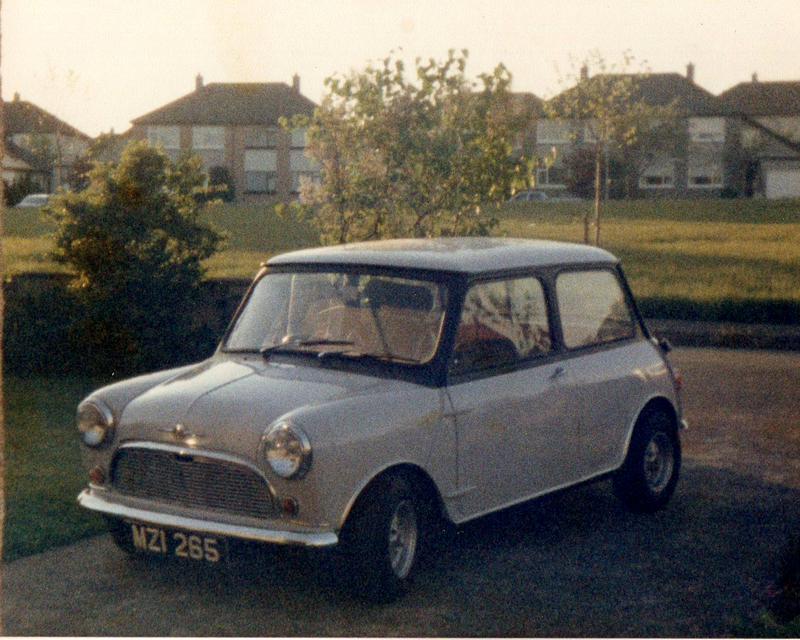 And given the ensuing thirty years of automotive orphans, waifs, strays and miscreants that have found a home at my door, it’s abundantly clear this Mini adventure taught me nothing. A version of this piece originally appeared on Car online. 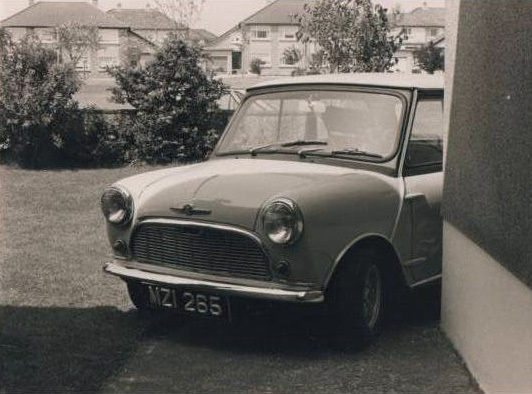 This little car became somewhat of an obsession in our family for contrasting reasons. I remember being tasked with filing and priming a large dent on the bootlid, by my younger brother (rather abruptly as I recall as he was in his McLaren Formula 1, Ron Dennis mode of “Don’t talk to me ….I’m thinking, I’m working” mode) Now, being the older and clearly the superior sibling here (in my mind at least) I was not keen to comply but for the sake of the common goal, (ie. me driving it around!) I mixed the filler and got on with the job, mumbling expletives to myself periodically in a cold suburban garage. The end result of all our toil (and my father’s mentally and physically health) seemed splendid to us and even though the wipers failed on me half way through a rainy journey from Blarney, as did the steering, requiring my entire body weight to be applied to the wheel just to get it to turn in, it was a very cool way of getting around in Cork in the 1980s. Everybody loved it and it was great fun to drive. In its retirement years, it also served as a fabulous hiding place when pretending to go to mass of a Sunday (This really is for another group meeting!) but it was eventually usurped by a more sensible, reliable and straightforward project, the aforementioned Alfa Romeo Alfasud. Oh Holy Mother Of Christ!! My brothers were left alone in a Mini with a can of black paint. They were five and six years old. Guess what happened.